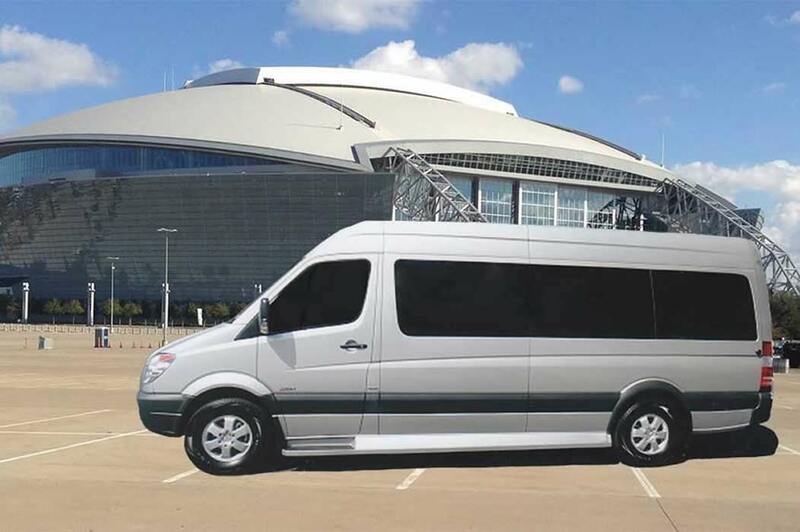 This tailgater van was built for Jane and Henry Stroup. Have your own layout idea? Just let us know. Let the party begin. Swing out the doors. Crank out the rear awning. Lower the TV, and rev up the sound system. 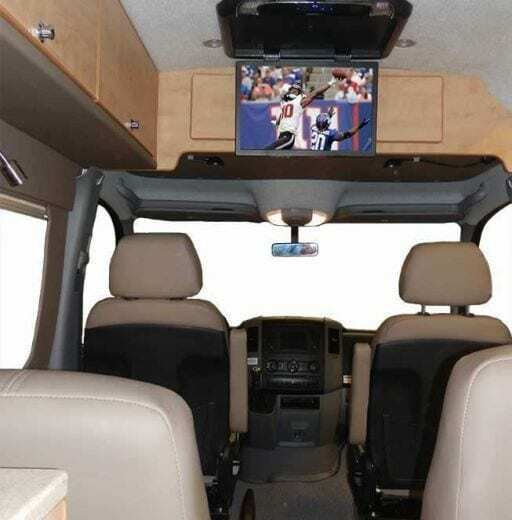 The 60″ widescreen TV can face out or into the van. The In-Motion HD dish satellite system also hooks into a DVR, DVD/Blu-ray player and Bluetooth wireless. 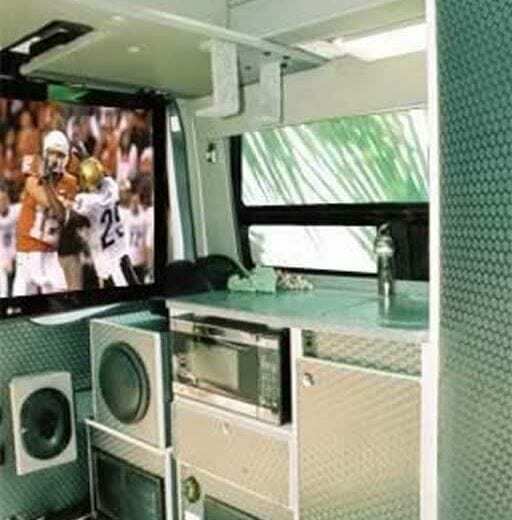 The sound system rocks on a Special Alpine iPod unit with seven speakers and a 10″ subwoofer. The rear speakers hinge out for quality surround sound from TV and XM. 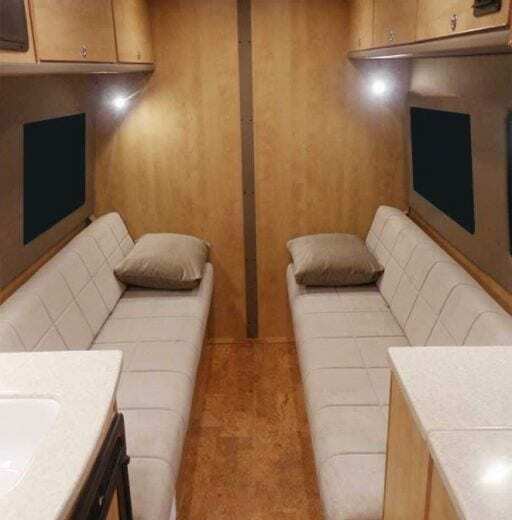 A portable Honda generator, housed in rear storage compartment on the rear door, provides 3000W on the beach or in the boonies for A/C, microwave and the other tailgating goodies. More generator info below. TV hinges up, out of the way. There’s lots of open floor space for an ice chest, grill and other fun stuff. The floor is covered with marine deck vinyl. Cabinets are laminated with rubberized Loncoin for appearance and super durability. Penthouse Expandable Top provides a very spacious 8′ ceiling when raised. Upstairs bed lowers from the ceiling for napping. 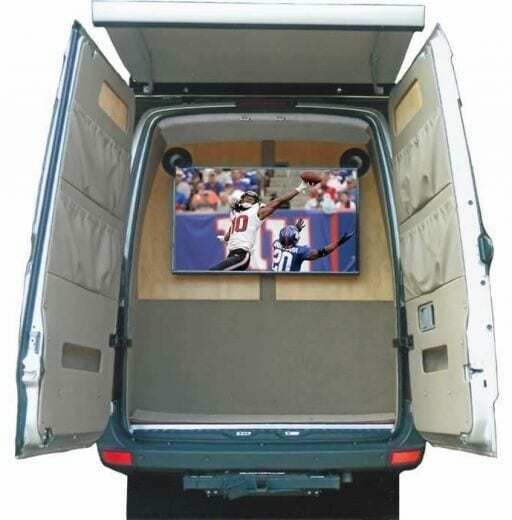 TV is shown facing into van. This tailgater will seat four and sleep two. The third and fourth Captain’s seats are very comfortable. 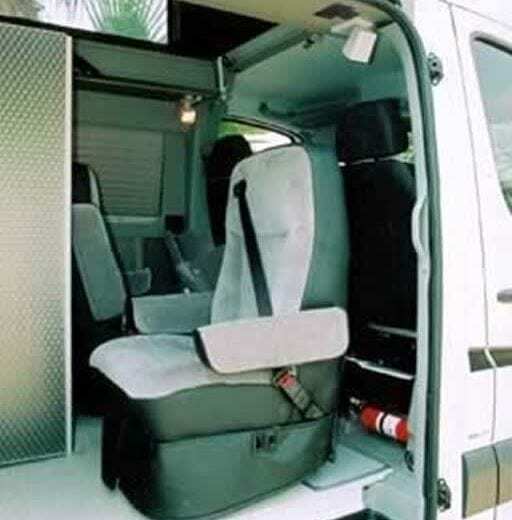 They swivel, recline and have fore/aft adjustments. They also can be removed easily by unfastening five bolts. Everyone knows tailgaters drink beer – and lots of it. The toilet compartment is large enough for even the big guys. Plenty of pee tank capacity, too, 29 gallons. Just park and swing open the doors. All of your tailgating stuff is right there. Shelves and compartments can be built in if desired. To keep sun-glare, and rain off the TV, extend the rear awning. 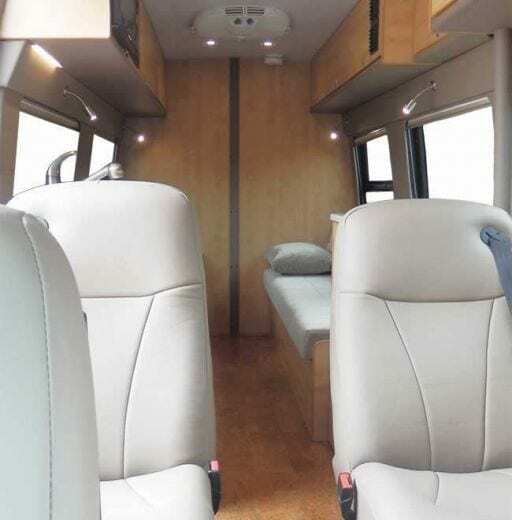 This owner included a A9 in motion satellite, custom 6 speaker surround sound, amplifier, and subwoofer.